After hearing a few suggestions to try out Drinker Pizza, I thought it would be a good idea to hit up my first establishment in Dunmore so off I went. I'm still not completely tired of plain pizza yet, so I stayed consistent in ordering a 1/2 tray red square for what I would call a value price of 5 bucks. After placing my order, I did notice a pizza-making "no-no." I noticed that the pizza was already premade with sauce and cheese already on it, then just stuck in the oven. (I'll have to write a future post about the proper way to cook an old forge pizza at home.) Although this method provided for service in world record time, it didn't allow the pizza to release all of it's flavors and potential, but I don't know everything and people love this place, so I'll get off my soap box and move on with the review! The cheese was a simple american which was melted perfectly, and was like flowing molten lava. I'm a big dumb animal, so of course I didn't waste any time in scalding my mouth on the creamy inferno. I liked the texture of the cheese, but it was either flavorless or overpowered by the sweet sauce. I've referred to a sauce as being sweet in prior blogs, but this is a very sweet sauce, probably an 8 out of 10, with 10 being a sugary bowl of Fruit Loops. The sauce really dictated the entire experience of the pizza. I myself am not a fan of this type of sauce, but I know many who are. If you fall into that category - get to Drinker Pizza. Finally, onto the crust. This component doesn't need much analyzing because it's clearly a premanufactured crust which you can get at any grocery store. I always prefer a crust made in house, as they have more character, tend to be lighter, fluffier, and crispier. This was a bit tougher, and had the consistency of a sourdough bread. It was cooked as well as could be given the premanufactured starting point. You won't earn many style points from this critic if you aren't making this in house. If you are looking to recreate this experience and save the gas money, you could probably make a similar pizza by going to your local supermarket, picking up an agostino's or longo's pizza shell, a jar of original Ragu sauce, and some shredded american cheese. If you are looking for the real thing, this pizza is clearly a staple in Dunmore, and has been for a long time, head down to Drinker street and pick up this value priced pie! I can describe this pizza in 2 words: SIMPLE, SWEET. People who enjoy a consistent, sweet pizza will love it. More akin to a bar pizza, and I would not put this in the heavyweight class with the Old Forge pizzas, although it is nearby the Pizza Capital of the World. Ok Pizza guy. here's the thing. You may have heard this from others but I wanted to drop it here. I've been eating Drinker Pizza for decades, decades! While you are correct that the sauce is sweet and pre-baking the crust is the way it was done back in the day by the nice ladies that ran the place in the old location. That's all a matter of personal taste. 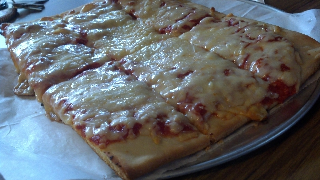 My point is that in eating their pizza for a very long time, I never, ever, had a square slice from the place. Not even sure I knew they have a square option that can be ordered in cuts. Go round pie next time. I'll tell you what, how about I add drinker pizza back to the list and specify that I review the round pizza next time? I went with the square because freinds of mine swear by it. Thanks so much for your input!!! Great suggestion. Thanks! Love the blog, nice work. Their sauce is still sweet. 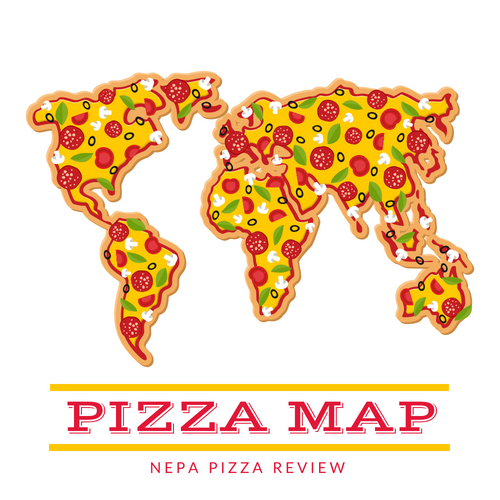 But that's what make NEPA the best for pizza, different styles and flavors. Good luck chasing down best hot wing pizza, best steak and cheese pizza and all the unique pies out there. I agree, it's a great feeling knowing we can say "I'm in the mood for pizza" and that alone only starts your decision making proces. Round or square? Sweet or salty? Greasy or not? Red or white? There's just an endless variety here in NEPA and I'm thrilled to live here because of it.